Readifood is supported by the parish of Our Lady and St Anne, and more detail will be included on this page in the near future. 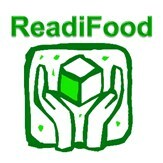 Follow this link for the Readifood website. ReadiFood currently deliver just around 120 Emergency Food Parcels every week to families and individuals across the greater Reading area. ReadiFood is run by FAITH Christian Group, more details of whom can be discovered on the Readifood website.